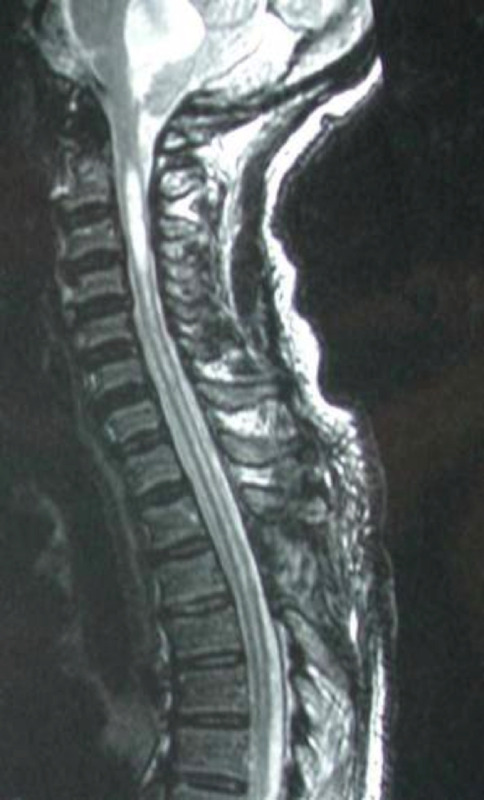 Syringomyelia refers to cystic cavitation of the spinal cord. The main diagnostic goal is to identify an etiology of the syrinx. Syrinx causes include Chiari I malformation, tumor, arachnoiditis, tethered cord, spina bifida, and trauma. Although syringomyelia should not be considered a primary pathological process, and finding the etiology is the foremost goal in management, many of the cases are idiopathic. Treatment is aimed at the etiology. However, when this approach fails, or if no etiology is found, a large syrinx can be shunted into the subarachnoid space, pleural cavity, or peritoneum. Syringomyelia – fluid-filled cavity of cord: Syringomyelia refers to a fluid-filled cavity within the parenchyma of the spinal cord. Traditionally, this cavity occurs outside the central canal (4, 20-22). The term in common use refers to any spinal cord cavitation. Hydromyelia – dilated central canal: Hydromyelia refers to a dilatation that occurs within the central canal. Since the pathophysiological and therapeutic distinctions between these two entities overlap and have been unclear at best in the literature, we will only use the term syringomyelia to refer to any spinal cord cavitation. Syringobulbia – cyst includes brainstem: A syringobulbia refers to a syrinx within the brainstem, which may or may not communicate with the fourth ventricle. Key is discovery of etiology: The key in the diagnosis and management of syringomyelia is to identify and treat the underlying cause of the cystic dilatation.